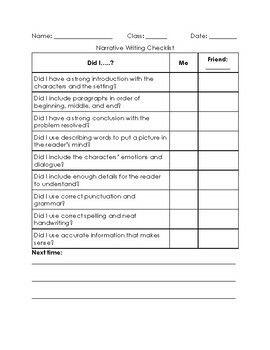 Informational and Narrative writing checklists students can use to assess their writing. 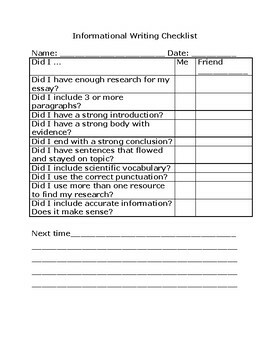 Your students can then use these checklists to work with a peer and based on what they did or didn't do, they can determine their next steps on the lines provided. These checklists are used in my classroom for EVERY writing piece and has become super helpful to keep them on track. My students know to use this to make sure their final writing piece has all the components necessary and have become experts on revising and editing their peer's work. This tool is great to teach independence and self- assessment in classrooms of all ages.